Image description: A digitally-painted portrait of Arkady, a dark-haired, light-skinned young man in a black cloak, with a mysterious golden flame in the background. Art by Amanda Grace Shu. 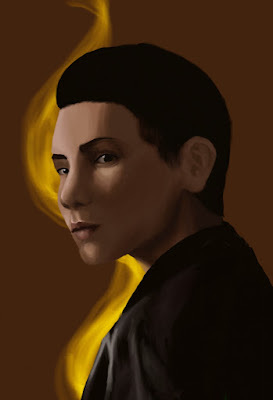 I recently came to the realization that I have posted incredibly little about Arkady fe Normonne, given that he is the primary protagonist of my novel. He has appeared as a secondary character in other excerpts I've posted, but nothing from his own point of view. That ends today. In honor of pride month, I present you with a short coming-out scene, narrated by Arkady (twelve years old when this takes place) and featuring Sebastian, whom you may remember from A Winter's Ball. Enjoy! They left the archery range and headed for a more secluded spot. Magic. Just the thought of it made Arkady’s heart beat a little faster. With magic, I could change my shape. I could make everyone see me the way I want to be seen. I could disguise myself and run away from here and live my life with nobody telling me what to do. Sebastian put his arm around Arkady, and just like that, the tears went away. For the first time in months, Arkady felt like he could breathe. He looked up at Sebastian, whose smile had faded a little. There was something dark and serious in the archer’s expression. Someone was calling for the Princess. It was time to rejoin Mother in the council hall. Arkady stood, gave Sebastian a grateful smile, and headed back toward the Citadel, breathing just a little easier than before.